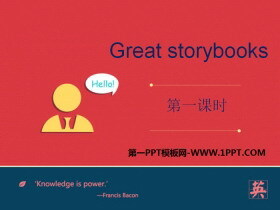 《Great storybooks》PPT 第一部分内容：Presentation Do you know these stories? The emperors new clothes The ugly duckling Snow White Cinderella Little Red Riding Hood ... ... ... 《Great storybooks》PPT，第二部..
《Reading signs》PPT课件 第一部分内容：Revision Do you know these signs? A story The path of stones Pre-reading Do you know them? Hello, Im Jane. Hi, Im Jack. Hi, Im father. ... ... ... 《Reading signs》PPT，第..
《PE lessons》PPT课件 第一部分内容：Review I like I am good at. Warming Do you like swimming? What do you need for a swimming lesson? ... ... ... 《PE lessons》PPT，第二部分内容：Presentation We need a swimsuit..